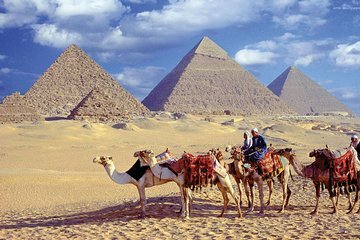 Experimente a grandeza das Grandes Pirâmides, da Esfinge e de outras maravilhas faraônicas em uma excursão de dia inteiro saindo do Cairo. Contemple as três pirâmides, incluindo a Grande Pirâmide de Quéops, em Gizé; e opte por entrar em qualquer um desses túmulos, andar de camelo ou visitar o Museu do Barco Solar. Depois de ver a Esfinge e o Templo do Vale em ruínas, continue em direção a Sakkara, lar da pirâmide de Djoser em degraus. Admire este túmulo, a pirâmide mais antiga do Egito e muito mais; e, em seguida, explore os restos da antiga capital de 5 mil anos do Egito, nas proximidades de Memphis. Maravilhe-se com os triunfos arquitetônicos que são as três pirâmides de Gizé, incluindo a Grande Pirâmide de Quéops. First, I was pleasantly surprised to receive a call at the hotel from Hussein the night before the trip to confirm pickup time and location. Then, due to weather conditions not very clear skies, we rearranged the trip and did the Memphis Museum first and then to Saqqara. On Hussein's recommendation, we went inside Titi's pyramid and the military leader's chamber...absolutely great trip. He handled all the tips, suggestions for pictures, and local nuances. 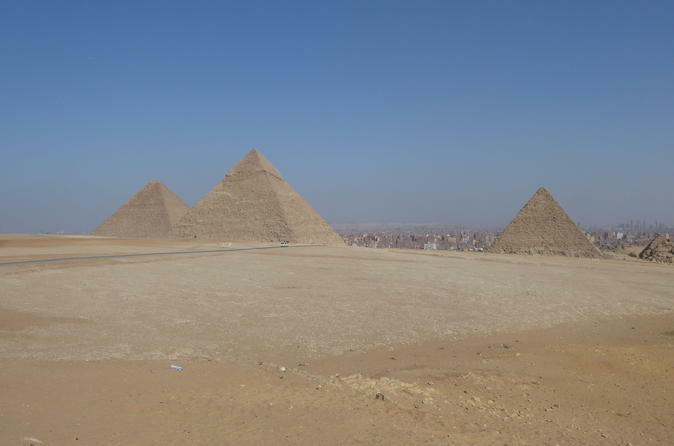 Then on to the Pyramids for the camel ride around and to Giza...which were perfect and the weather had cleared up nicely. Finally, after seven hours, he was still open to some last-minute shopping and took us in a couple places although I believe this is a hit or miss part of the trip as many shops sell the same 'one of a kind/top quality' items for different prices...suggest you shop around. We only had one day in Cairo, which isn't enough to really see all the city has to offer, but we accomplished what we came to do and it was due to the fantastic timing and efficiency of our guide.